As you go up Lundy Creek, after passing by the lake, you encounter two beaver ponds. There is evidence of a lot of beaver activity, (fallen gnawed logs) but the crew has never been working the times we’ve been there. Perhaps they were hiding out in their lodges until the humans went away. This stand of aspens were in the process of changing from green to gold, which made them look frosted on top. Later they would be yellow and orange – another equally dazzling combination. This is another in the group of paintings that I did recently at the Falkner Vineyard in Temecula, in San Diego County’s wine country. We arose early so that I could be in the vineyard as the sun came up over the distant hills. The light cloud cover kept the sun from shining quite so sharply in my eyes, which was a real benefit. 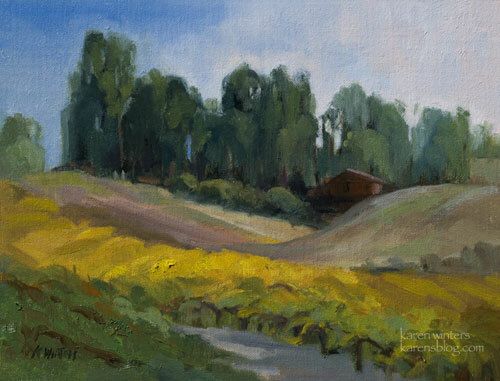 This painting was shot under warm incandescent light. Under outdoor light or window light, it will probably look a little bit different. 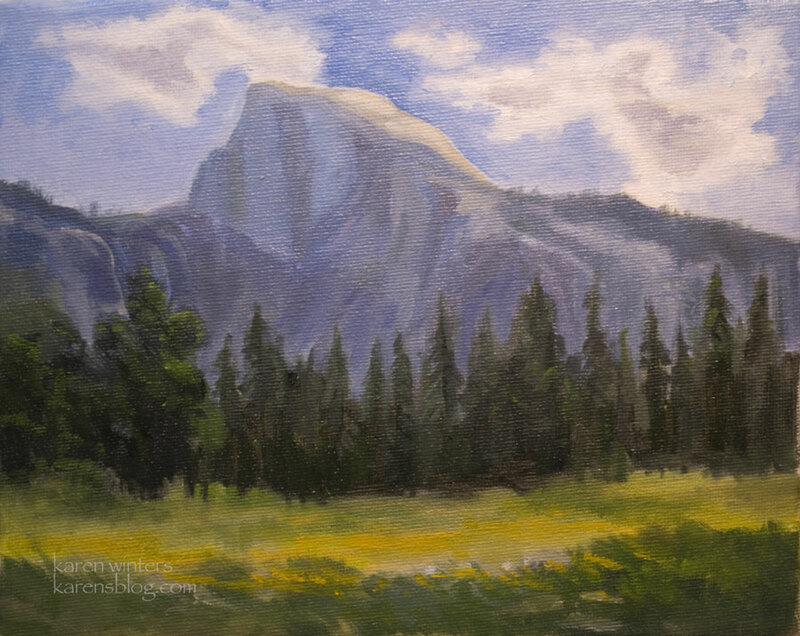 It’s amazing how different things look under different lighting conditions – for example, outdoors while I am painting something, and indoors in a gallery or living room setting, depending upon the color temperature of the lighting instruments. 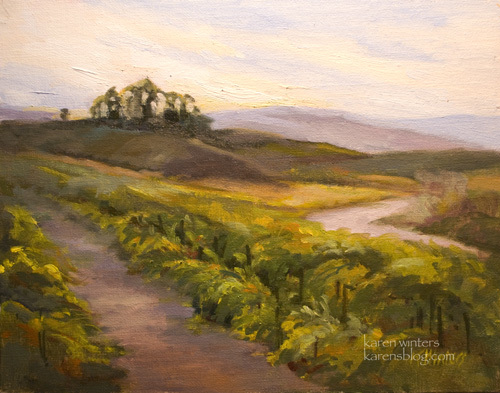 Some time in the next month, I hope to get up into central and northern California wine country to paint in some of those vineyards. If you know of some particularly beautiful ones, I’d love to hear your recommendations. 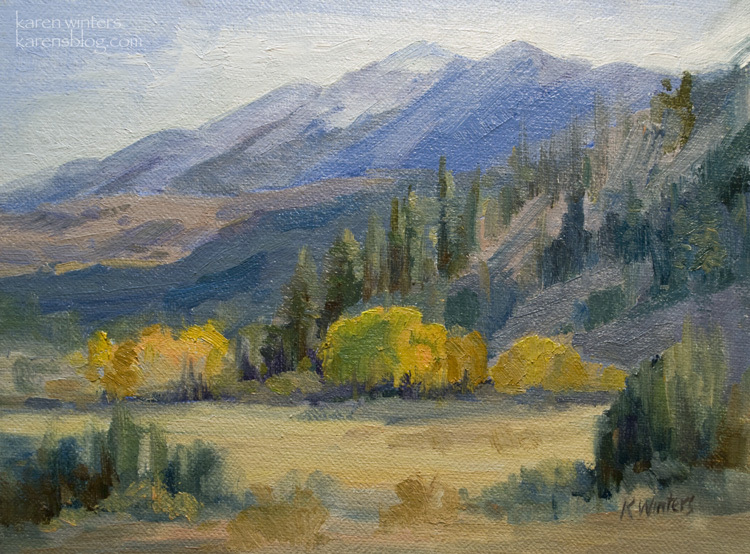 This little study features an area along highway 395 near the Sherwin grade, as the road climbs out of Bishop and leads up to June Lake and Mammoth Lakes. 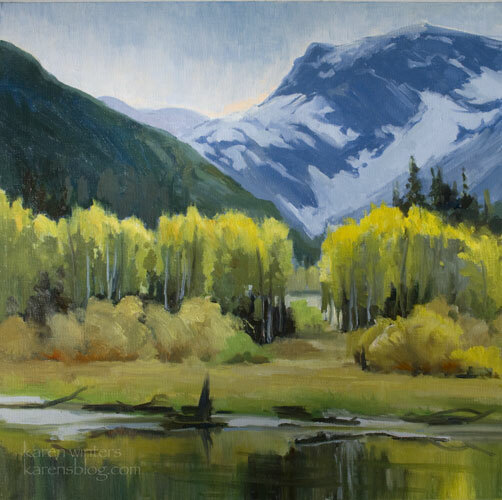 In October the aspens are starting their transition from green to gold, and the first dusting of snow can be seen on the high peaks. The grazing meadows have turned golden and fairly glow in the afternoon sun. This painting is for sale. It was photographed under bright incandescent light, indoors. It may look warmer or cooler on your monitor. When we were in the Central Coast area of California last spring, this scene suddenly caught my eye as we were driving back from Montana de Oro. 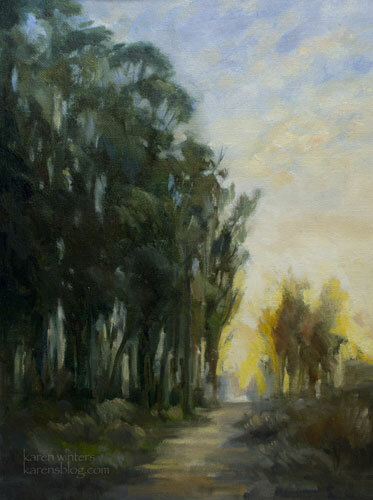 The towering eucalyptus trees (a favorite of mine) framed a long walkway into the sunset. Although it’s a simple composition, it puts me back in that place with the dusty road, the sweet smell of gum trees, the haze in the air and the sun lowering and glowing through it all. Last Sunday, we had the rare opportunity to watch a demonstration by noted painter Mian Situ for the California Art Club. It’s one of the many things that I really appreciate about being a member – there are so many occasions to learn something new and to be inspired by the “greats.” In addition to doing a masterful portrait in a very short period of time, Mian’s endearing personality and generous sharing of information made the occasion all the more special. 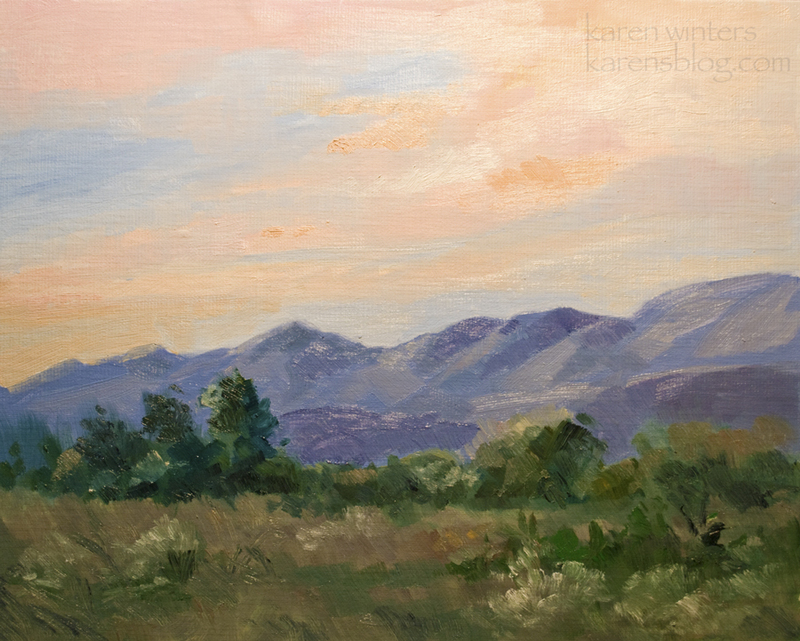 The end of the day at Carpinteria bluffs provides an opportunity to work out with the secondary colors – orange, violet and green. The Santa Ynez mountains glow in the fading light. Ecologically, this is described as a coastal sage environment. Typically you will find black sage, white sage, California buckwheat (the reddish brown plant, in fall) as well as toyon and brittlebrush. For the last few years, fall means visits to the Sierra and, at its feet, the Owens Valley. Not only do I love it for its serenity but also the exhilarating complementary color palette. This time of year everything is orange/gold and blue. Leaves tumble with every breeze that passes through. Sometimes a storm barrels through and turns a brilliantly colored tree into a sleeping skeleton in one night. 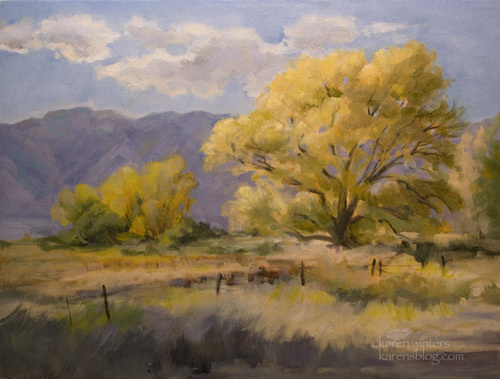 My attempt in this painting was to capture a more gentle mood near Bishop – a lightly breezy day before the soon-to-arrive storms. In a little less than 2 weeks, I’ll be taking some of my new work to the last Montrose Art Walk of the year. This will be my last outdoor show this season.